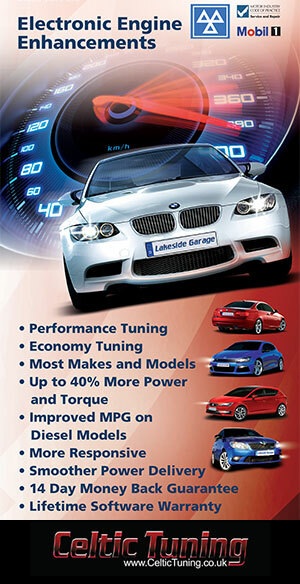 Lakeside carries out engine ECU Re maps for most makes and models of modern car. We are an Approved CelticTuning dealer. We have staff with a significant amount of experience in programming cars, and remapping is just another form of programming. Using this tried and tested software; we can help you find the right balance for your individual needs between power and economy. By carrying out a Remap on your car’s ECU (this is also known as chip – tuning), we have the flexibility to be able to tune the engine to your requirements, which means that the performance of the car will be optimised and it will run in the manner in which it was intended to run but with better performance. The software we use is safe and reliable with the ability to make immediate changes if necessary. These Remaps are proving to be very popular and the feedback from our customers has been more than positive. There are some very excited drivers out there who have fallen in love with their cars again!! Use the selection box on the right of the page to see what you could gain! Make sure you check out our latest posts on the home page see what offers we may have! Following the performance re-map and subsequent increase in bhp, there was an immediate improvement in the performance of the car; the acceleration is much more responsive; there is an appreciable increase in miles per gallon – noticeable even at this early stage [only on my second tankful since the upgrade], having covered 800 miles, mainly on the motorways.The car is much more enjoyable to drive; it reaches the higher speeds with seemingly greater ease and at lower rpm too. Overtaking is done with greater confidence, secure in the knowledge there is greater power beneath your foot and, above all of these points, it is great fun to drive. I have not experienced any negatives so far! Thanks Jay, it is much appreciated! Just had my Audi Q5 TDI remapped. I have not long owned the car and was not sure if I actually liked it. After it was remapped it has changed how the car drives, much more progressive and smoother and above all I now like the car! It’s now the car I wanted it to be before I bought it, thank you! Mr H, 2010 Audi Q5 3.0 TDI, Sunningdale. For more information on what you can expect from having an engine Remap or if you have any questions please call us on 01784 482158 and we will be happy to answer any questions you may have.